For me, Halloween is all about chocolate. Well, all holidays and special occasions shout chocolate at me, but Halloween seems to shout the loudest. All that sinfully dark, chocolaty-brown goodness contrasts so beautifully with all the bright oranges, yellows, greens, and purples of Halloween, and is very much in keeping with the spirit of fun indulgence that prevails at this time of year. When I was little, I would pick out all the chocolate from my bag of treats after trick-or-treating and let everything else go stale and uneaten. Some time after Valentines Day my mom would throw out the untouched liquorice, nougat bars, bubble gum, rice-crispy treats..... Now that I'm all grown up, I can buy as many chocolate goodies as I want, thank you, as well as bake them too. This recipe combines my two favorite things in the world: chocolate and peanut butter. This is a decadent, intensely chocolaty brownie bar that needs to be cut into fairly small little squares because it is so rich, even for me. .....but I still love all the adorable, clever cupcake papers and decorations you see everywhere. 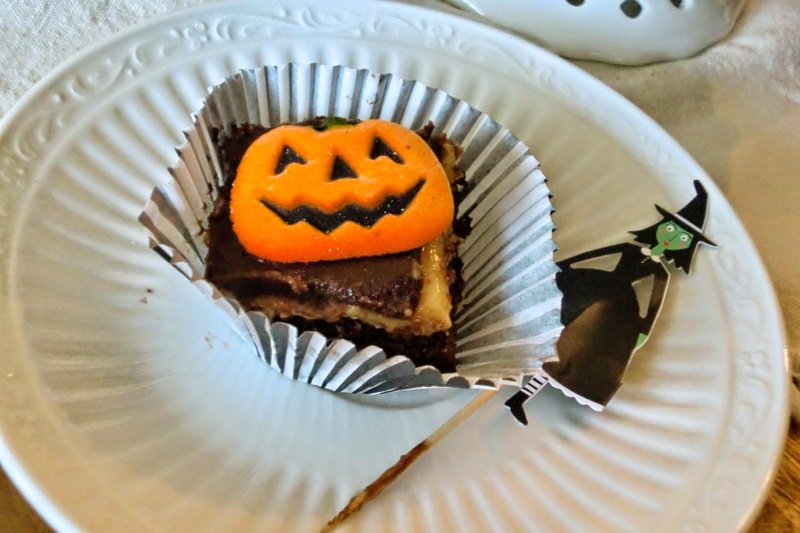 Plus the little decorations-on-a-toothpick insert very nicely into brownies and bar cookies. So I use them when I want to make brownies and cookies look especially pretty for guests and special occasions. I especially love all the Halloween things that are out there... these cupcake decorations that I found at Sur la Table work especially well with these deadly little chocolate peanut butter bars. 2. Heat a large saucepan of water on low heat (do not allow to boil). In a large, heat-proof bowl, combine the 1 cup butter, the 6 ounces of semisweet chocolate, and the 3 ounces of unsweetened chocolate and set bowl on top of the saucepan of hot water. Stir chocolate and butter until melted and smooth. Remove bowl from hot water and allow to cool to room temperature. 3. Line a 15x10x1-inch baking pan with foil, using enough so that about 2 inches of extra foil hangs over each end. Grease the foil with butter. 5. Add granulated sugar, brown sugar, and vanilla to cooled chocolate/butter mixture, beating well with a hand mixer. The mixture should look like very dark, gritty, chocolaty sludge. 6. Add eggs to the chocolate mixture one at a time, beating well after each egg. It’s important to beat the mixture thoroughly; after the fourth egg, the mixture should be significantly lighter in color. 7. Chop up the 6 ounce bittersweet chocolate bar into ¼ to ½ inch chunks. 8. Stir flour mixture into chocolate/butter/sugar/egg mixture until barely combined; you should still see a moderate amount of unincorporated flour. 8. Add the 6 ounces of chopped bittersweet chocolate bar and stir until just combined and all flour is incorporated. Do not over-stir or the bars will be tough. 9. Spread the batter evenly in the foil-lined pan and bake for 20 to 25 minutes or until a toothpick inserted in the center comes out with a few moist crumbs. Cool in the pan on a wire rack. 10. Combine peanut butter and the ¼ cup of softened butter in a large bowl, beating with an electric mixer until combined and smooth. 11. Add 2 cups of the powdered sugar, beat until combined. Beat in a couple tablespoons of milk and add the remaining 2 cups of powdered sugar. The mixture will be very stiff. Beat in enough of the remaining milk so that the frosting is still fairly stiff, but spreadable. This is something where you need to adjust the amount of milk so that the frosting isn't too thin, yet you can still spread the frosting without tearing up the brownie bars. 12. Spread frosting over cooled bars while still in the pan. 13. Place the broken up 8 ounces of bittersweet chocolate into a medium bowl. Bring the 1 cup of whipping cream just to a boil and then add to the bowl of chocolate and let stand for 5 minutes. Whisk the chocolate until smooth and shiny. 14. Let the glaze cool for 30 minutes and pour over the bars, tilting the pan to spread the glaze evenly. Chill the bars in the refrigerator until the glaze is set and then remove the bars from the pan, using the overhanging foil to lift out. Cut the bars using a large, sharp knife or pastry cutter. Store at room temperature or in the refrigerator, based on your preference. I prefer room-temperature brownies and cookies since I find that chilling inhibits the flavor.